This disc, showcasing music by a number of Australian composers, is issued by Jade Records, the company formed by composer Robert Allworth. It is one of a remarkable number of discs that Jade has issued dedicated to the Australian contemporary scene. Allworth says that he draws much inspiration in his composition from the sacred aspects of Roman Catholicism. This is evident in the first piece on the disc, a group of six voluntaries, written in honour of Saint Catherine Laboure and the Immaculate Conception of the Blessed Virgin Mary. Again, Allworth uses a very effective mixture of slow, held chords against plainchant-like themes. It is only in the later voluntaries that the fuller tonal palette of the organ comes in to play. 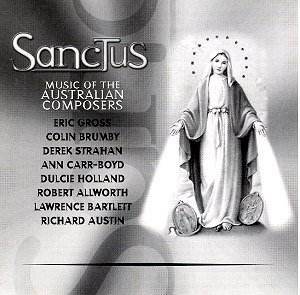 The next item is the first of three curiosities, an historical track from 1979 of the Sanctus from Palestrina�s �Missa Aeterna Christi Munera� recorded live. The choir, singing in English, give a creditable performance but there is quite a bit of tape hiss and ambient noise. This item is really limited interest to the general listener. The next curiosity is an organ piece written for the Gospel procession, arranged from an extract from Saint-Saëns� Third Symphony. This tuneful extract has had the misfortune to be catchy enough to be taken out of context for various purposes, even for a pop song. The Gospel procession is completed by a short voluntary by Dom Gregory Murray. A final curiosity is a short hymn by John Keble from the 19th Century St. Alban�s Tune Book. Lawrence Bartlett�s �Ceremonial Te Deum� is a lively attractive work for choir and organ. It was commissioned as part of the Australian Bicentennial celebrations and sung at a service on 31st January 1988 in the presence of the Prince of Wales. This recording was made at that occasion. The choral part is rather syncopated and rhythmically interesting, supported by spicy harmonies. It sounds fun to sing and would be a most useful piece in a choir�s repertoire. Colin Brumby�s �All Glory, Laud and Honour�, a lively choral prelude based on the well known hymn, is the last sacred piece on the disc. All the remaining ones are of a secular nature. Ann Carr-Boyd plays here own piano solo, �Saturn�. A piece with exposed melodic lines over percussive chords. You almost feel that a work for instrumental ensemble is trying to break out. Dulcie Holland�s string quartet, �Salute to Jacques� is an attractive, well-made piece in a melodic, rather English manner. In fact Holland studied at the Royal College of Music in the 1930s, with John Ireland. Later, in the 1950s, she studied in London with Mátyás Seiber. Holland�s other work on the disc, �Lonely Valley�, is for an ensemble of mandolins. To her credit, Holland has constructed an atmospheric work which manages to avoid all suggestion of the Russian balalaika ensemble. Eric Gross�s three movement piece for solo violin, �Triptych�, is quite a strenuous work. Rather chromatic and expressionist, it nonetheless displays considerable melodic power. Violinist Alexey Guliyantsky gives a brilliant performance which was recorded during a concert tour in Yalt, Ukraine. For his suite for unaccompanied cello, Derek Strahan has gone back to the baroque era for inspiration. Where Bach based his instrumental music on contemporary dances, Strahan has done the same. But in this case, he uses popular 20th century dances so that the movements are Prelude-Riffs, Tango, Boogie-Woogie, Blues, Soft-Shoe Shuffle, Fugal Jive, Coda. The opening prelude is rather expressionist, but soon becomes jazz-inspired in its rhythm and harmony. In all the movements, the rhythm and harmonic structure of the original are never far away. But Strahan occasionally leaves these behind and creates looser episodes. Georg Pedersen�s playing is stunning, as in movements such as the tango and the boogie-woogie. He manages to include both melody and accompaniment in a way that has you struggling to believe that there is only one player. The final piece on the disc is a short piano piece played by the composer, Richard Austin. Pleasantly reflective, it forms a quiet close to what is a fascinating disc.